I've always had a soft spot for the diamond fold! This one features four of the five gorgeous images included in the Christmas Magic stamp set (which also includes three lovely greetings). 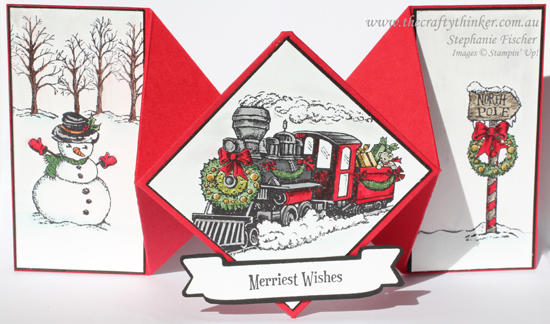 The Stampin' Trimmer makes it sooo easy to create this card! They're made from a piece of cardstock 12" x 4", so I usually cut my 12" cardstock into three and make three at a time. 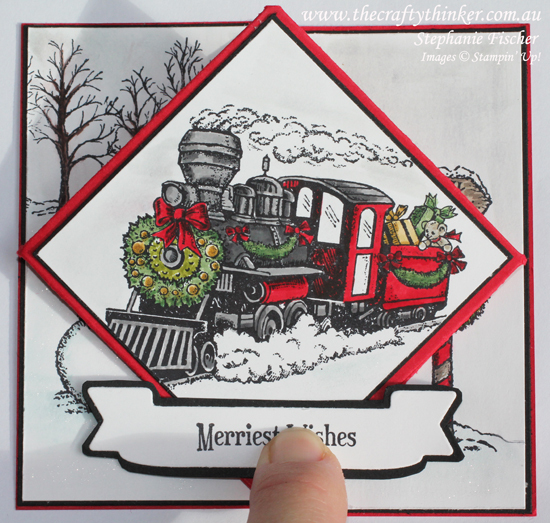 I stamped the images onto Whisper White cardstock with Basic Black Archival ink and coloured them with a variety of Stampin' Write Markers from the Many Marvellous Markers box. I masked the snowman before stamping the trees. Although it doesn't show up very well in my photos, I watercoloured the sky and snow areas with Smoky Slate and Sky Blue (using the blue for the snow). There's a touch of Gold Wink of Stella on the wreath decorations. I cut out the greeting with the banner from the Large Numbers Framelits, glued it to some Basic Black cardstock and snipped around it to create the black border. 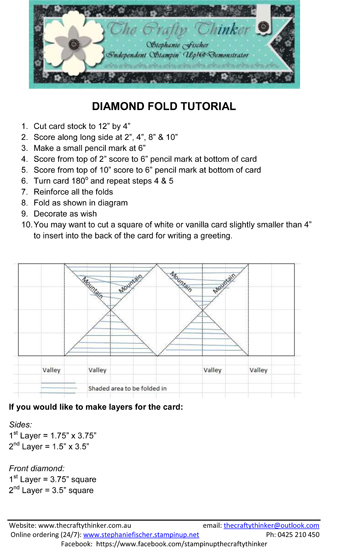 The card folds up into a 4" square.